So far so good. 3 days of success! And tomorrow is Sunday so I get a day to snooze (alarm) - hooray! "When I consider your heavens, the works of your fingers, the moon and the stars that you have set into place, what is man that you are mindful of him, the son of man that you care for him?" Further along, I was thinking about new growth on plants. And then I was thinking about pruning. I remember when I used to have houseplants. (I just don't have anywhere to put them right now...) There are two types of houseplants: those that are untended and grow up tall and skinny, kind of scraggily and those that are tended, pruned and grow up robust and fat and tall. I had this great plant (no idea what it was called) and it started to grow too tall and skinny, so I started pruning the new growth at the top and it started sprouting buds at the bottom. Pretty soon it was much stronger, healthier and more robust all around. Well, as I was thinking about this, I was thinking about our lives and how the Lord tends and prunes us like plants. That sometimes a closed door is like being pruned - we are forced to look for another option and in doing so, we become stronger, more robust, hardier. And that sometimes this happens over and over (like me clipping the top of my plant) but ultimately it serves to make me stronger, to force my roots deeper. That at other times we are allowed to bloom in season, but that at the end of that season, we are pruned - the blooms are cut off and we are trimmed back (dead-heading) - and it hurts. It feels like we are being constrained and limited and that there is not future ahead. But when the spring comes, we can stretch our arms and we are fresh and new. Even though I chafe under the pruning and in the constraining; even though I hate when I am walking a path and the door is shut, or when I just feel like I am coming into my own (blooming) and then get cut off..... When I remember the lesson of my plants, I am grateful for the masterful, careful, thoughtful attention of the Gardener. The One who does not prune just to use the clippers, who does not "deadhead" just because we are wilty - but who does all these things because He has a plan for the landscape (me and those around me) and his plan is purposeful, not haphazard. Sometimes its good to remember that. Enjoy your weekend. I hope that as you see Spring beginning all around you, it will remind you that God is in every season of our lives. Saw this video posted on a friend's website and thought it was a good candidate for this week's Friday Fun! Its the comedian "Louis CK" on how different the world is today... and how impatient we are because of it. Today I woke up before my alarm went off. So it was kind of nice, because it was like the Lord gave me a natural snooze alarm! I was able to doze until the alarm went off which was really nice - and most importantly, I was able to switch on the coffee, so when I did get up at the alarm, the coffee smell was delightful. This morning I read Acts 10. This is the chapter that tells the story of the gospel being taken to the Gentiles. (Read it here if you are interested: Acts 10) It was a neat reading for today, since the discipline that I have added during Lent is prayer walking - and mostly, I am planning on praying for those men and women who live in the community around me. As I was walking, after having read that passage, it gave me renewed confidence in the Lord's power to call those who he is planning to call. When the Lord calls your name, you cannot resist. I don't know that I'll post about each of the 39 days I am participating in Lent. But I wanted to post today and let you know that I did survive day #1, and am actually looking forward to day #2. Be blessed. And keep your eyes ready for tomorrow's "Friday Fun" video! Today is Ash Wednesday, the first day of the Lenten Season in the Christian church. For those of you who are less informed about the Christian faith, or who just want more info on the season of Lent and traditions associated with it, please select this link for a some great info regarding Lent. As you read in that post, Lent is honored over 40 days to represent the 40 days that Jesus spent fasting in the wilderness at the beginning of his ministry. The 40 days are often counted excluding the Sundays (which are celebrated in honor of the resurrection) and so the season begins with today: Ash Wednesday, when men and women all over the world recieve "the imposition of ashes" (the little ash cross on their foreheads) to represent the way that men and women mourned during bible times - by tearing their clothes, putting on sack-cloth (like burlap, I think) and putting ashes on themselves. It is a representation of sacrifice and loss. Men and women also often give up something of value to them, and also often take on some sort of spiritual discipline. There have been many Lenten seasons in my life when I have not given up anything. I used to rebel against any type of liturgy or tradition that I felt was legalistic. But in the past few years, I have developed a more graceful approach to liturgical traditions, and developed a love for the practices of the ancient church. There is something neat about participating in traditions that have existed for hundreds of years. Lets face it. I often also did not sacrifice because I didn't want to give something up. But now I try to put it in better perspective. Whatever I am giving up, is only for 40 days - and I get to indulge on Sundays! When I compare my puny sacrifice to Christ's sacrifice for me, it is worth it to give up something. That being said, I have a list of things I could give up, but I have also been taken with the idea of not just giving up something, but taking on a spiritual discipline in its place. By taking on a discipline, hopefully my sacrifice is a real concerted effort to include God in my life more. This year I have decided to give up my snooze alarm for Lent. I have realized that lately more and more I have been snoozing for multiple times and losing time in the morning. It makes it more difficult for me to have my quiet time, and I can feel my discipline lacking. I am going to take on prayer walking. My plan is that in the mornings I will get up and have my quiet time and then prayer walk around my big block. I'm really looking forward to these 40 days (which I am actually starting tomorrow, because I didn't make my decision until this morning's quiet time). My prayer is that the Lord would be more and more present within my life and through my life into the lives of others. I pray that if you are making a Lenten sacrifice or adding on a spiritual discipline, that you would be blessed through your experience and God would be glorified. "Lent is a season of soul-searching and repentance. It is a season for reflection and taking stock. Lent originated in the very earliest days of the Church as a preparatory time for Easter, when the faithful rededicated themselves and when converts were instructed in the faith and prepared for baptism. By observing the forty days of Lent, the individual Christian imitates Jesus’ withdrawal into the wilderness for forty days. All churches that have a continuous history extending before AD 1500 observe Lent. The ancient church that wrote, collected, canonized, and propagated the New Testament also observed Lent, believing it to be a commandment from the apostles. (See The Apostolic Constitutions, Book V, Section III.)" "Because Sunday is the day of the Resurrection, we skip over Sundays when we calculate the length of Lent. Therefore, in the Western Church, Lent always begins on Ash Wednesday, the seventh Wednesday before Easter. In many countries, the last day before Lent (called Mardi Gras, Shrove Tuesday, Carnival, or Fasching) has become a last fling before the solemnity of Lent. For centuries, it was customary to fast by abstaining from meat during Lent, which is why some people call the festival Carnival, which is Latin for farewell to meat." If your church does not celebrate Lent and you wonder why, click here. I recently began re-using "Discovering the Bible" by Gordon Addington as my quiet time guide. The book is a 365 day plan for reading the bible in one year, with brief commentary on the chapters you've read for the day. What I like most about it is that its a "plan" to follow. Two things stood out to me today as I was reading. First, in Leviticus 15, which has to do with regulations for various discharges, including "women during their monthly flow of blood." This is the second time I've read this passage in 2009, because we were also studying it in BSF. But this time I was thinking about the women from Mark 9 as I read it. The women who had been bleeding for 12 years. She was unclean for 12 years. Unable to touch anyone in her family unless they were willing to be made unclean for the day. An outcast. I love that when she saw Jesus she had hope that he could heal her, but even more than that, I love that when she touched Jesus he didn't let her skulk away, but instead called her forward and addressed her as "woman" - that he wasn't angry she touched him or that she did it secretly. And mostly, I love that when she touched him, she was healed. The other part of the reading that stood out to me was in Job 11. Job's friends didn't have completely wrong understandings of who God is or his sovereignty - but the did have some misconceptions about God's behavior and Job's behavior. Their philosophy was sort of like "The Secret." The philosophy of "The Secret" is that if you think positively about good things then good things will happen to you, and if bad things happen to you, then you secretly wanted them to happen. Yes, people, its not the gospel - don't buy into the Secret... no matter what Oprah says. Anyway, Job's friends are saying things like, "Job, if you do good, then God will be good to you, so you must have sinned somehow and its not OK for you to argue about it." I think we say a lot of this stuff to people today, even when we don't realize it. We don't understand God's sovereignty, and so we can't understand how good and bad things can both exist. And because of that, we say things to people like, "Things will get better! God is a good God, he gives good gifts!" and we neglect to say, "I don't know if things will get better. We don't have promises that our life will be easy and absent of trial." And we never remember that Jesus told us "In this life you will have trouble" - that our blessing is to be found in the next part of the sentence, "But don't worry, I have overcome the world"
Anyway, those are just my thoughts this morning. Ultimately, I believe that God is a good God and DOES give good gifts to his children. But I also believe that we will encounter trial in our lives, sometimes as a result of our sin, and sometimes as a result of living in a fallen world. But that even when i'm in the midst of sad circumstances in this world, God is not changed and God has not abandoned me - or you, dear friend. OK, I have to go study now. Make it a great day! One of my favorite clips from the Ellen Degeneres show is the one I've put up here. We watched it together in my office at Baylor and laughed and laughed. :) I hope you have the same reaction! Today's "Friday Fun" is desperately needed, because I've spent the afternoon at my kitchen table working on statistics - totally not my favorite subject. So enjoy -and remember to always look on the bright side of life! My new favorite snack: Margarita Popcorn! I've invented a new snack. Yes, I'm sure someone else invented it before me, but since I made it up without knowing if someone else invented it... then I feel like I get to say I invented it. :) Anyway, just in case, I googled it and it doesn't show up, so I'm standing firm. Well, its the easiest thing in the world, so I'll tell you how it came about to make this post worthwhile. I love popcorn! Stove top, please, not microwave. My friend Liz turned me onto it when we were in Greenville, and now I've made all my friends and my family addicted to it, too. Its cheaper than microwave, and without preservatives, etc. You can make it with or without butter and its good either way. I like to use Sea Salt because it has a little stronger flavor - when I was in TX we often made it with just a little salt, and sometimes parmesan cheese, but over the summer I fell back in love with a teeny bit of melted butter, too. DELISH people!!! I've decided to call it "Margartia Popcorn" - and I'm telling you, if you are in the mood for a new, fun snack..... give it a try. It is so delicious, I'm snacking on some right now. I think that you may even end up eating a little less salt because the lime sort of makes all the other flavors more intense. Thats all for now - happy President's day snacking!! What a great day! Sometimes I have celebrated Valentine's day with friends and we watched chick flicks, ate chocolate and rejoiced together (while maybe secretly being bitter about being single). Now in reality, I know that most of the celebration we consider "Valentine's Day" is a Hallmark holiday - and that most of the bitterness and grief associated with the holiday comes from societal pressures to be married. I also know that the Lord created man and woman, and that he did so because it wasn't good for man to be alone. So to some degree, our wishing to be dating or married is not surprising and our sadness in not having that is something God understands. All that being said - today was one of my favorite Valentine's days ever!! My parents drove in late last night for a brief LA weekend with their favorite daughter. :) This morning we met for breakfast at the Corner Bakery and then drove down to Santa Monica beach to enjoy a few hours in the sand. It was pretty cold (probably 45 degrees, with the wind) but clear and sunny and beautiful and you would not believe how many people were there enjoying it. It was really nice to just chat for a few hours, read, and relax together. After our beach time, we drove back to my apartment, changed our clothes and got ready for our evening plans. My friend Amy was planning to join us and when she arrived we headed out for our evening activites! SO - we invited Yen Ling and Amy to join us, but Yen Ling already had plans. These gals are good friends of mine at UCLA and I was really glad that Amy was able to join us! We decided to go to "Confessions of a Shopaholic" and then Buca di Beppo for dinner. The movie was GREAT - so fun and we laughted a ton. It was really fun to have the chance to laugh like crazy and see a sweet (PG) movie that I will eventually totally want to own. :) We were at the City Walk, at Universal City/Studios, so there is a ton of shops and restaurants, etc. Its a really fun area. The wait at Buca was about an hour, so we had drinks and chatting at Jillian's while we waited and then headed back to the restaurant. The food was spectacular and both Amy and I were able to bring home leftovers - which was like an added bonus!! We told stories, laughed a bunch, and really hade a great time. All in all, it was a great valentine's day. I love spending time with my parents and my last visit to Phx I didn't have much time with them, so it was really great to just get to hear about their lives, love on them and be loved in return. What a joy. So I hope you felt loved today, friends, and at the least, I hope you know that the God of the Universe knows you and loves you. Sometimes my friends find really funny things on facebook, and this morning I happened across this video of a little girl narrating a story about kittens and it was so funny, that I wanted to share it with you - faithful readers - in honor of Valentine's Day (or Friday the 13th - whichever). Anyway, Tonight I am headed to an engagement party of one of my former youth group girls. It is awesome that she and her family live down here (in orange county) and so I get to participate in things like this! Late tonight my parents are headed up from Phoenix so that we can enjoy a visit together tomorrow. I'm especially blessed, because its valentine's day and I love them - so won't it be nice to spend it with them! They leave on Sunday morning before church because dad has class on Monday. Hopefully this weekend I'll have other interesting updates for you. Just a little fun video for you today, in lieu of a post. This is a video from CBS in January - a segment that happens on the Friday evening news, called "Assignment America." This report, Steve Hartman goes around the country and reports each Friday night on an interesting story. Its my favorite news segment around, hands down. Its only 2 1/2-ish minutes, and totally worth your time - you will be encouraged! Today my church took a field trip. 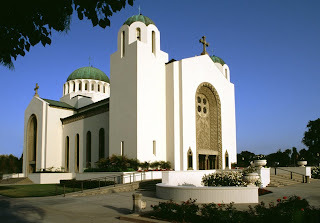 We took four charter buses to St. Sophia Cathedral, a Greek-Orthodox church in downtown LA. I was so excited to attend the service, and so glad that I attend a church that thinks its valuable to bridge our denominational differences and worship Jesus together. About a year ago, Katie Bug and I drove down to Austin to attend the Greek Festival and St. Nicolas church. We didn't get to attend a service, but Father Jim gave us a lot of great info about Greek Orthodoxy (and I think I posted about it on the tiffslifeinwaco blog). The pictures above and below are from their website. 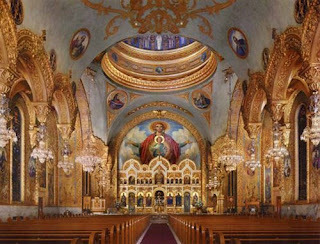 If you haven't been inside a Greek Orthodox church before, you are in for an experience. 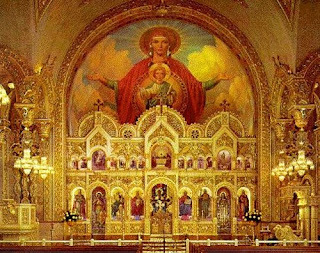 The inside is lush and ornate, bright and shiny - everything at St. Sophia is painted gold and the icons are in beautiful rich colors. From the outside you wouldn't know it. The outside is modest, sedate, strong and attractive, but not showy. Father John explained that the sanctuary is a temple, for the Greek Orthodox, and the inside is full of light. He talked about how this is a representation of the believer, and how the believer is filled with the Holy Spirit's light - and that with the indwelling Holy Spirit we are ornate and rich and beautiful on the inside. I especially appreciated this analogy, when I think of Peter's words that we are not to be showy and adorned in ornate ways on the outside - we as believers are supposed to be modest, but also supposed to share the light of Christ that is on our inside. Anyway, I thought that was a really neat analogy. I love that in the Greek Orthodox church you worship from start to finish with all of your senses, not to mention your heart and mind. The entire service is sung/chanted and I was surprised at how beautiful it was. I didn't know what to expect, but Father John has a beautiful voice and it made me think about how I often sing my praises in the morning, during my quiet time, and that the Lord is blessed when we worship him in that way. We were so welcomed into the family at St. Sophia's and it was neat to see my church really live what it believes - which is that in order to make LA the greatest city for Christ, it is going to take all the Christian churches - and that we are all going to have to reach across denominational barriers. I am grateful that in heaven we will all worship together at the throne of Christ, and I pray that we can increasingly worship together here on earth! p.s. check out the latest star sighting to the right! !